Boston bowler Jonathan West represented England at the Under 25 level in the International Series in Northern Ireland this weekend. Also on Saturday and Sunday, Chelsea Tomlin - a Boston and Spalding player - captained the England female Under 25s to a splendid victory in the International Series held at Nottingham. England won all matches and one of Chelsea’s teammates included Ruby Hill, another Lincolnshire competitor. In the Boston Indoor Bowling League, Eastenders continued to set the pace in the Orchard Health Group Division One with a 6-0 victory over bottom-placed Norprint. Tony Hall, Chris Avison and Merv Pack nearly caused a shock against Paul Flatters,who recovered from 12-16 down to edge home 16-12. Holland Fen lost ground, losing 4-2 to Invaders. 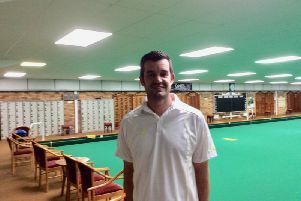 Scott Whyers won 21-14 and Ron Flowers responded 21-16 on the other rink. Punchbowlers also upset the form book with a 4-2 victory over Carlton Road. D. Gill, A. Limb and I. Reeson had a convincing 24-8 win over G. Parker’s rink, securing the aggregate as Chris Gill’s rink won 20-12 for Carlton Road. A40 won 6-0 against Strollers to maintain fourth position. Mid-table battles saw Jolly Farmers gain a 4-2 victory against Red 5 and Royal Mail defeat IBC 4-2. Roy Vinter’s rink came from 9-7 down to win eight ends on the bounce to record a 26-13 for the Mail and secure the aggregate points. In Division Two, third-place Golfers had a great 6-0 victory over Parthians, who were in second place. Top team Breakaways lost 4-2 to the bottom team The Burtons. D. Bailey got a 20-16 victory which outpointed Gordon Gallichan’s 16-15 win for the Breakaways. Autos’ J. Homewood won 20-13 against Boston Park to secure a 4-2 victory as A. Batchelor won 16-15 with a last-end count of two to get the Park’s points. Patriarchs are putting in some good performances and skips T. Beck and M. Rate recorded wins for a 6-0 result against Poachers. Cosmos beat fellow promoted team Vikings 6-0. Dynamics maintained their Division Three lead with a 6-0 victory over Phoenix, but G. Wilkinson came from 13-7 down at 13 ends to win 22-14. With second-placed Nomads on a bye week the Tryers drew level on points with a 6-0 victory over Bias. Amateurs shared the points with Central and Fairways earned a 4-2 victory against Shipmates. Anthea Hall’s rink win of 18-10 outweighed the 18-16 of Shipmates’ P. Robinson. Hotspurs took the lion’s share against U3 thanks to R. Pepperdine, R. Hoey and G. Porter winning 22-8 to give them a 4-2 victory.